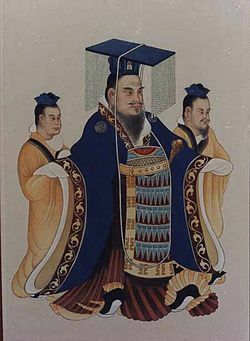 Short: Emperor Wu[lower-alpha 2] (武帝) "mairtial"
Full: Xiao Wu Huangdi[lower-alpha 3] (孝武皇帝) "filial an mairtial"
"The Mairtial Emperor o Han"
Emperor Wu o Han (30 Juin 156 BC – 29 Mairch 87 BC), born Liu Che, coortesy name Tong, wis the seivent emperor o the Han dynasty o Cheenae, rulin frae 141–87 BC. ↑ Haed his name cheenged intae the mair suitable Che whan he wis offeecially made croun prince in Apryle 150 BC. ↑ Leeterally meaning "filial an mairtial". dae nae mention a coortesy name. This page wis last eeditit on 6 October 2018, at 06:15.